Apologies in advance that this post is going to be full of festive photographs when Christmas is now over (SOB!) But before we pack away the decorations for another year I thought I'd look back at the things that happened in December that didn't make the blog ... as you can imagine this involves a lot of food! I hope you all had a brilliant Christmas and are looking forward to the new start in 2018! I became rather obsessed with Hadrian's Tipi this month, Newcastle's festive pop up of fire pits and food huts. 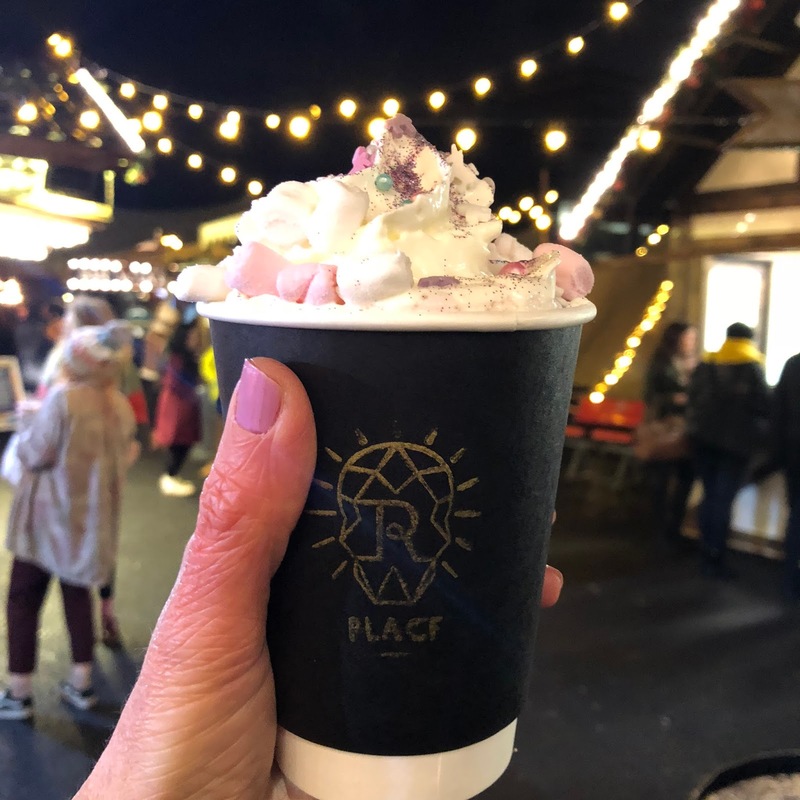 My first visit was for the Unicorn Hot Chocolate from Its R Place which very quickly became "insta-famous" in the Toon! A little cup of naughtiness the hot chocolate was topped with a mountain of cream, pink marshmallows, glitter and little colourful unicorns - I don't think I'll ever find a hot chocolate as good as this one! Christmas in Newcastle felt extra special this year, alongside the amazing new look Hadrian's Tipi the Christmas Market also seemed much bigger and better than previous years. I spent a lot of time just strolling around the city centre taking photographs and doing a spot of people watching. Everything just looked so beautiful and I'm dreading all of the decorations coming down in a few weeks, Newcastle is going to look so bare! Another day, another trip to Hadrian's Tipi (I promise you they are not sponsoring this blog post!) Our best food discovery of the month had to be Fowl Play who set up shop at the Tipi and fed the folks of Newcastle with THE best chicken and waffles. Oh wow, they were seriously good, so good that I'm now really hoping they open up a restaurant soon because the thought of being without these guys when the Tipi shuts makes me very sad. Come on guys, make my day! Every Christmas we like to pay a little visit to Jesmond Dene House and this year we went all out and enjoyed a festive meal with eight of our friends in one of their beautiful private dining rooms followed by an overnight stay. It's been years since we stayed at Jesmond Dene House so it was lovely to stay the night again. The ultimate indulgence happened on the Sunday morning when we snuggled up in our dressing gowns and enjoyed breakfast in bed. It wouldn't be Christmas if we didn't tuck into some Christmas burgers and this year we decided to visit Byron Burger for their epic Cheesemas menu. I'm a little cheese obsessed so their special festive burger, The Fromagemas was right up my street - a 6 oz hamburger stuffed with Barber's cheddar, Barber's Red Leicester, Byron cheese and crispy Grana Padano all served with a little jug of Byron cheese sauce (that I poured in my burger and over my chips!) Forget the turkey, Christmas is all about the cheese! I had my eye on this hat from M&S for a good couple of weeks before purchasing it, although I loved it each time I tried it on in store I wasn't sure if it really suited me or if I'd be brave enough to wear it out and about. For some reason walking around with a hat on your head feels like a pretty bold statement which isn't ideal when you're not exactly a confident fashonista. I'm so glad I was brave though, I love it and it's fantastic on bad hair days! For years I've been wanting the White Company's famous Winter Candle and this year I finally got my hands on one and I'm so happy that I did. Our house has smelt delicious all season - the beautiful combination of cinnamon and clove is the perfect warming scent for Christmas. They currently have 20% off in the sales and I'm tempted to get a few so I'm fully prepared for next year. Evans in Whitley Bay has been on my list of new places to visit for a while now so at Christmas we finally made a plan and joined some friends at the restaurant for a delicious Christmas dinner. It made me so happy that I live in the North and people understand the importance of covering your plate in gravy. Our meal was delicious and I can't wait to return for a date night soon. I planned a big surprise for Simon's 40th birthday this month and flew him out to Dublin for a special trip. I booked it all back in the Summer and have no idea how I managed to keep it a secret from him (especially as I told everyone that we knew all about it and then had to swear each person to secrecy!) We had a brilliant time and I'm looking forward to sharing our trip with you properly in the New Year. Dublin is only a 50 minute flight away from Newcastle and if you're looking to plan an adventure in 2018 I highly recommend. How gorgeous are my new Bulgari shades? I bought them in Newcastle Airport on our way to Dublin and I'm completely smitten. Buying new sunglasses in the airport seems to be my new thing, much to Simon's dismay, I think I tried on every single pair in Duty Free before I chose these! This photo was taken during a very long and boring car trip from Newcastle to Norwich to see my family for Christmas, the only good thing about that journey was being able to wear these new shades for the first time! For more adventures from New Girl in Toon make sure you follow me on Instagram. I post a new photo every day! Thank you, I love them! I love the hat! I feel the same way, I feel really exposed when I wear a hat even though I'm told I suit them. I actually think in the winter it makes you a bit more conspicuous! I have the world's most uncontrollable hair so it's nice to have the option to hide it, especially in Winter!